This training session, led by Andy Sewrey, served as an introduction to our new apprentice painters and a review for our seasoned painters on the proper way to mask and protect a customer’s home, inside and out. So, this is mask and site protection training, for you guys. [2 mins] We’re just going to assume that we’re talking to folks that haven’t painted. I know a lot of you have but some of these basics are just good to come back to. You know? If we’re talking about a power forward in basketball, it’s always good for him to go back and, like, work on his footwork. Like the basic, basic stuff. That’s what makes them good. So…masking if probably the most important thing we do from the beginning of the job. You guys have to remember that when you hit a jobsite, this is, for most people, the most valuable thing in their life that’s not their kids or their family. So, when we walk in, everything you see, they care about; everything you see is super important to them and we have to act accordingly. So, there’s some steps to that. Generally speaking, the first thing when we show up that you want to do is probably have a drop cloth, not your tools. Okay? You walk into a home, or outside, before you set anything down, we want to make sure that stuff goes on something that’s ours [3 mins] – it’s on a drop, floor paper, you know, a tarp. Doesn’t matter. We have stuff that’s liquid. Things can spill, things can leak. It happens. Always just start there. Like the basics. Even to the point, if you’re in a kitchen with a stone countertop, don’t put a tool on that countertop unless it’s covered. If it’s not covered, throw a rag down, put your tool on the rag. All those little details are super important. [noise in background] Is that Omar? So all those details are really super important. Omar you can come on up. Andy: It’s alright. It’s going to be alright. You just going to hang out there? Andy: So, again, all…anytime you set anything on a surface in a customer’s home, it needs to be protected. That’s the first thing and then as we move forward to your work, obviously you’re covering floors. [4 mins] There’s multiple ways to do that. We’ll talk about it little bit. You’re covering glass – ways to do that. We’ll talk about that. At the beginning of any job, and you guys have done a great job here. There’s masking all over the place. You’re going to want to make sure that as we move forward into the job, that same process is the same. So when you show up, throw down a drop, put your tools on the drop, and you’re going to go work. Make sure, you know, floors are covered -first thing is you’re going to walk on. If you’re working on, you know, windows, you’re going to want to do that. If you’re on an exterior, you have to protect plants. If that were outside, that’d be the perfect way to do it [pointing at plant that has been covered in plastic]. We use plastic. We use, you know, big tarps. We use all sorts of different things. Can someone grab me a roll of floor paper please? Andy: Okay. Cool. The basics on covering floors: you’ve got drop cloths, you’ve got floor paper, sometimes we use plastic, but not that often. We’ll just start with drops and then we can get floor paper. There’s a difference between an interior drop and an exterior drop. What do you guys think that is? Can somebody tell me what the difference between an exterior and interior drop is? Andy: That’s a good point. Oh thank you [to receiving floor paper]. Andy: Outside, not usually, unless it’s hard surfaces. The main difference between an interior and exterior is that interior drops are cleaner. Right? If you pick up a drop that comes from the shop and it’s all full of dust and dirt and everything else and you walk into a home, you’re bringing outside, inside. Right? That’s the difference. So, take a look at what you have. [6 mins] That’s always super important. There’s different types of drops. We tend to just use canvas drops here, although, I brought one with me that I want to talk about that we may or may not use moving forward. I love these and the difference between this and what we usually use is, this is canvas on one side and butyl rubber on the back. Liquids don’t go through these. So for guys that have painted, if there’s a drop of paint on a drop cloth and you step on it, it’ll mash it straight through the weave of the fabric into the carpet or onto the floor. That doesn’t happen with these. The main thing you have to remember with these is that you always put the rubber side down. Always. And the reason for that is that if something gets on it, it’ll dry quicker if it absorbs into the fabric if it’s on top. So, again, if you step on it, it’ll mash it into the fabric, it’ll dry up quicker, and you won’t be tracking it as much. A couple of safety issues with these, you really gotta watch them on hardwood floors. They’re slippery, and they’re usually not good on an exterior on a roof. [7 mins] Where on a texture of an asphalt roof, with a normal canvas, we stick to that asphalt really well. These things will turn into a sled. So, I’ve learned that one the hard way. So, you guys just take a look at that. I don’t know if you guys have worked with those before but they’re quite cool. Drops are usually used if you’re rolling ceilings, rolling walls and those sorts of things. We use floor paper on hard surfaces, so hardwood floors, concrete walkways, decks outside when you’ve got a, like a wood surface that you’re masking off. This stuff is no good on carpet [holds up floor paper]. It just doesn’t work. So, just know that. It’s the wrong thing for carpet. Specifically, we always use floor paper when we’re doing millwork, like here. So, there are a couple of reasons. [8 mins] Number one, it allows you to mask tight to the millwork, itself, and you can clean a floor that’s covered in floor paper, even vacuum it, and when we’re spraying millwork, dust is a problem. So, it protects the floor well. Most of the paper is pretty good at keeping liquids from transporting through it. It allows you to get a tight edge and it allows you to clean. That’s super important. And even if you’re brushing and not spraying, you’ll still run a perimeter of floor paper around, so you’ll go that width [holds up floor paper roll to the wall] all the way around the room, and if you think about this a little bit, now you’ve got a three foot wide workspace that is always covered with your stuff as you trek around the room and do your work, you’re always over something. You can throw a drop in the middle of the floor to cover the volume of the floor, but this [holding up floor paper] will make sure you have something to do, you have something to work over from there. We use hand maskers and, you know, twelve inch paper. You know, if we have somebody – do we have tools on this floor? Is there a hand-masker here? Andy: You have not. Okay. So. It’s a pretty straight forward tool. There are two spindles. One holds paper. One holds tape. It puts the tape on the paper for you. This might be the most useful tool we use. Every painter will say that. There’s a few details about hand maskers and how they’re used. There’s different blades that attach to these. Most of the guys in the field use what’s called a film blade and it’s actually for putting plastic on this and it cuts. They’re just sharper and they work better. If you’re going to have one, get the film blade. [10 mins] The film blade will work with paper and plastic. The paper blade will not work with the plastic. So, it’s rare that we use the film on a hand masker but when we do you want to have the right blade. And the reason we use the film on a masker is if you can pull out a big sheet of plastic, put it on the wall, run it down, it’s moving faster. You’re not going to be able to go faster if you have the wrong blade on the masker. It defeats the whole purpose. So, that’s what that’s for. And this, again, just in this environment you can see what it’s for. We use it to, you know, protect a surface close to one that we’re working. If you had a, for instance, a door knob sticking out, like behind you guys here. If you were going to be rolling up here [gestures toward top of/above doors] and not spraying, when you roll you’ll end up with like the roller spatter that falls, if you simply just go above the door knob and put a hat on it, that shields that stuff from raining down on top. It’s like an eave on a house, and you’ll see the more you work around the journeymen capping things with those, so they get used in all sorts of different ways. [11 mins] We have floor paper. We have plastic. We have our hand-masker stuff. There’s all sorts of different kinds of tape. Right? So, the two you’re probably most familiar with: plain old white tape, which is what’s on there [gestures to door knob hat] and the blue tape. They’re very different and they’re for different things. You use the tape, effectively, on anything that is going to be thrown away. Does that make sense? And you guys have done it right here. So, all the joints in the floor paper, when you’re taping from paper to paper, use the white tape. It’s less expensive. It sticks, actually, better. It’s really high tack. But once you stick it to something, once you leave it for a few days, it’s not coming off. It’ll bond, basically stick to it and now you gotta get chemicals to clean that wood off. The blue tape is for any surface that matters. [12 mins] So, floors, walls, windows, anything that’s, you know, we need to save and protect. You use the blue tape on that. So, again, depending on what you’re doing, if you’re going up to the wall and you need to mask directly to paint, you generally are going to want to have blue tape on your masker, if, you know, to a surface that’s sensitive. If you’re taping down, you know, paper to something that’s already masked, use the white tape. Talk to your job lead about this. It’s a goofy detail but if you notice like on this job how much tape we’ve used, it’s about a four dollar a roll difference in cost here. We might use sixty of these [holds up white tape] in a day. If you did it all in this [holds up blue tape], that’s $240 down the tubes. That’s what we could be paying a guy to work and it’s just going in the garbage in tape. So, it matters. Specialty tapes, there’s more than this, but these are kind of the basics. This is the blue tape. The easiest way to identify it is, it’s the blue tape with the orange core. See how there’s orange in the middle? [13 mins] This stuff is the super sensitive surface tape. For really delicate surfaces, if you’re taping on a faux finish, maybe a wall covering like wallpaper, something like that, or a smooth surface where you want a really sharp line, it tends to give you less bleed. It does not stick as well as the normal blue. So, it’s lighter tack. You definitely don’t want to use it everywhere. It’s not that sort of thing. But there are specialty situations where you need this stuff and it’s fantastic when you need it. This is lacquer tape. These are all the 3M products, but this is the lacquer tape. This stuff is one of the highest tack tapes we use. It’s super sticky and it’s chemical resistant. So if you are spraying lacquer, like a hot solvent based finish, that’s not oil paint, that’s kind of the next step up and you use blue tape on the wall, when you spray the paint will rewet the blue in the tape and it’ll all just start coming off the wall. [14 mins] Everything gets behind it, the lacquer eats the wall paint, and so on and so on and so on. So you end up with problems. When we get into lacquer jobs, we’ll run a line of this [holds up lacquer tape]. There’s other chemical resistant paints but we’re going to start with this one. You’ll run an edge around your perimeter and then tape to that. So that that joint, that hard joint, is tight. Again, this is for specialty situations, you’re not going to use it a lot but you need to know it when you do. And then duct tape. Everyone’s seen duct tape. Generally speaking, we use this stuff when we have to tape to concrete. It’s the only time I’ve really found it useful and not created problems for myself, so on exteriors – have you guys had to mask off a foundation on an exterior before? No? So. At the bottom of a house, the siding will stop and you’ll see an exposed foundation. There’s a lot of times where we have to protect that and they don’t want it painted. Blue tape will fall right off, when you spray the paper blows everywhere and it just doesn’t work. [15 mins] You can run around with this [holds up duct tape] and run a stripe, again, of that to give you a firm surface to tape to. So you just stripe it out. Chris: Of the duct tape? Andy: Yeah. You just stripe it out with duct tape and back it and use your hand masker and your plastic. Whatever you need to use to tape to the duct tape because any of them will stick to the duct tape and the duct tape will stick to the concrete. This is good on asphalt roofs, as well [holds up duct tape]. On the normal roofs that are usually a little dirty and weird, this is usually where you want to go. Those are the basics of the materials. We’re going to stop for a minute here and reset. There’s a couple of things I want to talk to you about about windows but we need to move to the other room to do it. So that’s that for now. Let’s go in here. Andy: Alright, so. Masking glass. This is, um, seems easy. There’s one thing I really want you guys to pay attention to when you’re masking glass, and that’s that you have to mask it before you do any work on the window or door or whatever you might be painting or staining. [16 mins] And the reason for that is you’ll almost always have to sand down right to that edge. Right? Usually with a sanding sponge, one of these guys. You’re almost always getting in there and mowing on it. they’re flexible, right? Where’s that grit going to go? It’s going to hit the glass. It’ll scratch the bejeezus out of this glass when you do it and you can’t get those scratches out. So, once you scratch the window, we’re buying a window. Again, I’ve learned this one the hard way. It’s important. So, when we do that, especially if you’re painting down to the glass, you always want to mask everything first before you get started on it. There’s a few different ways to do it. Who here has masked a lot? I know, Jose, you have. Who hasn’t masked much? You haven’t [looking at Chris]? Andy: Ok. Aside from the hand-masker, a one and a half inch flexible putty knife has actually got good corners on it. When you use these a lot, they start looking like butter knives. The corners wear away, they get all round and they’re great for spackle. One of these is probably the best masking tool you have. Okay? That’s what I’ve found. You can do a lot of good work in corners. Getting you floor details right and that sort of thing. When you go to a window like this, if you have your tape – this corner is always annoying. Right? Folks who get in there and try to use their razor knife, again, now you’re taking a pointy thing and putting it on glass and if you do it wrong, you’re going to scratch it. What I like to do, this is one of those points where it’s okay to be a little wasteful. So if you run your tape up the line, leave at least an inch and a half, maybe two inches, tailing out on your corner. [18 mins] It has to be long. If it’s a little teeny bit, it isn’t going to work, but if you put that up there. Come over here. Stand over here so you can see this. This’ll be good [to Chris]. If you just run this in and lay it flat, don’t put it like that [holds putty knife perpendicular to glass], just lay it flat, and then pop that off [rips tape along knife edge]. You just nailed your corner. Right? So this will speed up the time, when you’re working. The other thing it does is make sure that the line sets and if you just leave this flat and lightly run it down and now you’ve got a clean line and if you use inch and a half tape on it, it’s covering the width of the sanding sponge. This isn’t license to try and sand your tape with the sanding sponge. Okay? If you sit here and try and rub it, you’ll cut through it, but if you’re sanding on it and you slip, you’re going to protect the glass. And then from there when you use your hand masker, you have a smaller area, you know, it’s easier, to finish everything off. [19 mins] You guys got any questions on that stuff? Chris: Why do you use your hand-masker on such a small area? Chris: I don’t know. Just putting a piece of paper in there? Andy: Well, that’s what you’re doing with your hand-masker. If we had put tape all the way around the perimeter. If we did, we’d stick this guy in [holds up ripped off piece of taped paper from hand-masker and puts in window] and there was blue tape and you trimmed the bottom. Got it. And a lot of guys will start here [same thing], put that up there, and then tape the sides, and we’ll do that in a specific training. Chris: So you put down the blue tape and then on top of it the other. Andy: Sometimes. There’s a more efficient way to do it, but we’re not going to get into the detail of that here but I can show you that one on one or your site lead can. You’ll get trained on how to mask a French window and we can do that specifically. The main point of this is protecting the glass. That’s the main point of everything we’re talking about here – is protecting their stuff. Andy: So this [points to blue tape masking] is just keeping you from damaging this [points to window pane] and allowing you to work on this [points to wood frame]. So, same thing as the floor, same thing as a light, grass outside. Somebody’s tree. Their car. You know, the guys can show you exactly how to do that. 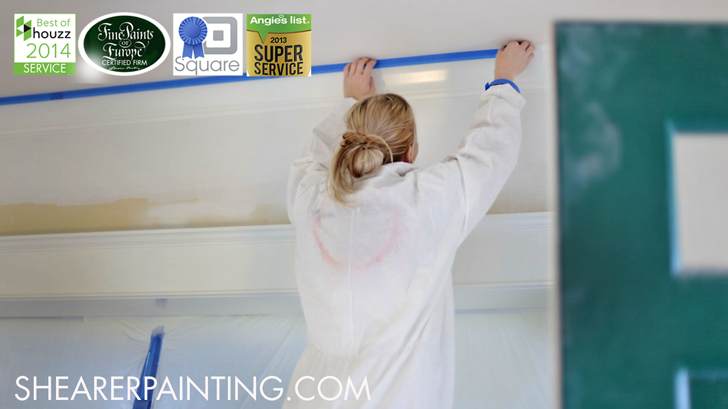 Take your painters film, which is the same thing you see in here on the ceiling – the thin plastic. Run that stuff over the whole card, button it up, take it down under the bumpers so that the whole thing is there and then when you’re spraying outside and when that cloud of overspray rolls down the block, we didn’t just decide to de tail twenty cars that day. Okay? Does that make sense? Alright guys. That’s the basics of the materials we use and really why we use them. We’ll do more training on the specifics on how to mask a floor, on specifics on how to mask a window, but before you start masking a floor and masking a window, or anything, as soon as you show up at a jobsite, you have to be sure that your mind frame is set. [21 mins] We have to respect their house, we have to protect their house before we can do the work. Make sense? Thanks guys.